I am a hard sucker for mountains, and one of the prettier drives I've driven was a drive from Bozeman to Kalispell. I traveled with three companions (two from over the ocean) and at a non-snowy period where everything is green (go between May and July for best results), there's few places that can compare. And of course, no road trip would be complete without a good coffee stop somewhere in the middle, which going the long scenic route, Missoula falls smack in the middle. 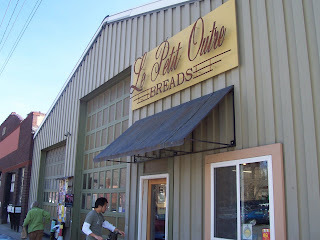 Ironically, the place that got the most legitimate hype in my research was actually a bakery, Le Petit Outre (I tried an online translator to guess the name's meaning and it came out to roughly "the other little one"). The location is right near the old downtown of the city, on the corner of a side street with perpendicular parking. The exterior to my recollection was nothing fancy, a standard barn-esque structure with a really beautiful sign. The interior was a huge bakery warehouse of sorts with a large rack of bakery delights as well as a small coffee counter behind the register. Basically, the place was much more of a grab and go then a sit and study. They serve Espresso Vivace out of Seattle and much like Vivace, strictly stick to espresso. They seem to be huge fans of David Schomer (the barista sang me his praises and recommended to me his book) and judging from the shots pulled and the quality taste, they know a good deal about pulling shots. No filtered coffee here (to my recollection), so grab an americano. Don't remember if they had tea or not. On a less common side note, since they're known more as a bakery, I did grab an almond croissant which was out of this world, so I would also propose grabbing a baked item to complement your drink. Thus, if you ever find yourself in Missoula in need of a French pastry and an espresso, give Le Petit Outre a go, especially if you're there in the winter; you'll need something to warm you up. Alas, I have not been back but in looking over my posts I realized that a 4+ did not aptly describe my experience and that Le Petit Outre demonstrated a 5+ for sure (I think it had to do with a past, now-debunked opinion that a place that doesn't serve non-espresso was inferior to a place that served both (2007 was a long time ago for me in coffee knowledge)). I hear that the place is still going strong (and ironically enough, now seems to serve non-espresso coffee). I completely agree about LPO: superb coffee drip or espresso, along with great breads, baked goods, and specialty items like olive oils, cheese, and salami. It's a great spot for a weekend breakfast and definitely popular with coffee lovers in town. You can also but whole beans from Black Coffee Roasters (in Missoula) and DOMA (near Couer d'Alene). And if you are ever in the Lake Tahoe/Truckee area, they serve some great coffee at the Trokay Cafe using Blue Bottle beans brought in fresh from Oakland. BB, along with Verve Coffee Roasters in Santa Cruz, are two of my favorite spots in Northern California for both the awesome vibe and the superior beans.